Mobile Order is one of the amazing features at Walt Disney World found within the My Disney Experience app. 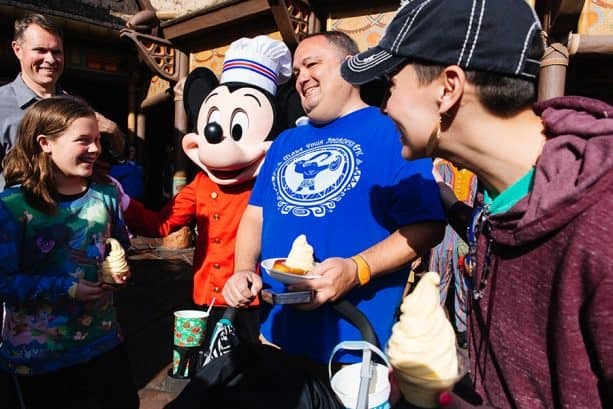 The feature allows guests to order their meal in advance at most of the quick service locations in the parks and other locations so that they can avoid the lines. Walt Disney World recently celebrated an amazing milestone with this feature by celebrating the 1 millionth food order via My Disney Experience mobile ordering. Of course Mickey was there to celebrate the occasion, too! It is always fun when Chef Mickey Mouse shows up. The celebration took place at Magic Kingdom Park with Walt Disney World Resort Ambassadors and a variety of cast members. 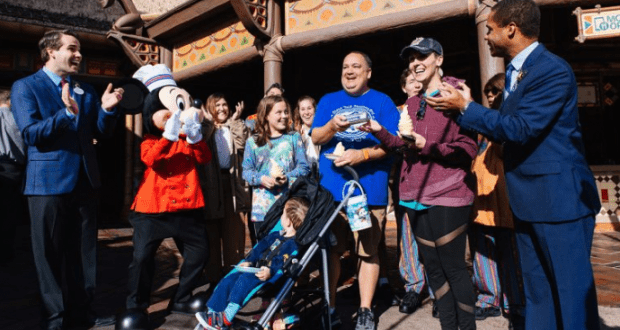 The crew surprised and honored the Ramos family from Winston-Salem, North Carolina as they picked up their mobile order of Dole® Whip items at Aloha Isle. Disney also gave the Ramos family a $500 gift card to use for more food and beverage purchases! What a cool surprise, huh? It is easy to see why the service is extremely popular given how easy it is to use and how much time it saves. The service has also been expanded to Disneyland Resort, available at more than 20 quick service dining locations there. If you want to take advantage of the service at either Walt Disney World or Disneyland, then guests will need to make sure to download the My Disney Experience app and set up their free account. There are a lot of great features within the app, including Mobile Order, that will help you stay organized and access your vital information during your vacation. Who out there has tried out Mobile Order thus far?